The Revenant was a movie I knew I had to see from the first time I glimpsed its preview. A frozen wasteland. A grizzly Leo DiCaprio. An even grizzlier Tom F’n Hardy. And not to mention an actual grizzly bear. Terrible things were about to happen. Even watching the trailer, I could just feel it. First, let me hit you with some truth. The Revenant is NOT for everyone. It’s not for kids. It’s not for teenagers. It’s not for the faint of heart. It’s not for fans of Michael Bay, Kevin Hart, superhero movies, or happy endings. It’s dark. And when I say dark, I don’t mean in a visual sense. Or a gothic, ‘look how angst-ridden the hero is’ sense. What I mean is that the subject matter gets down to the very bottom of what it is to be desperate. And human. And hungry. The Revenant may very well be the darkest movie I’ve ever seen. And the longer I lie here and dwell on it, the more I like it. What we’ve got here is Leo DiCaprio as Hugh Glass, an enigmatic tracker/hunter in the service of Captain Andrew Henry (Played sharply by Domhnall Gleeson.) Also in their group are the brutal John Fitzgerald (Tom Hardy) and the young Hawk, who happens to be half-Native American (and Hugh Glass’s son.) These men find themselves on an expedition to collect and prepare hundreds of animal skins for sale, presumably to the American army. Without giving anything away, the whole sell-animal-skins plan goes downhill…and fast. The Native American Arikara, hostile with every right to be, get involved. A grizzly bear shows up. Tom Hardy is pissed. And death starts happening. Because The Revenant is violent. So very violent. It’s not stylized. It’s not pretty. It’s not epic. It’s harsh. And it’s realistic. By realistic I mean it’s so visceral and unwashed that it feels like this is how real life was. It’s the opposite of The Matrix’s pretty skirmishes, Lord of the Rings’ bloodless warfare, and even Saving Private Ryan’s booming, catastrophic clashes. 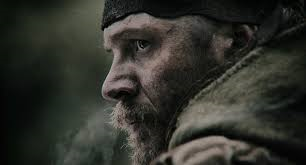 If I had to pick a movie to step through a door and experience in real-life, The Revenant would be last on the list. I’d be dead in seconds. And so would you. But it’s also beautiful. So very beautiful. I fully expect this movie to take home the easiest Oscar for best cinematography ever. Not that awards matter. They don’t. What I mean is; every frame of The Revenant is poetry in motion. From the cold, sharp, deadly mountains to the frosted rivers to the snow-blanketed plains, the landscapes are stunning. I sat in my seat and felt the wind blowing over me. I saw the characters wandering beneath moonlit skies, and I was held rapt. The shots were all real. Very little CGI. The Revenant’s terrifying world is the truth. These places exist. So what’s the point? What are these hard, hard men doing out in the middle in winter? It’s clear from frame one that some brave and foolish white men are moving through the wilderness during the last stages of the war against the Native American tribes of the American Northwest. They’re risking their asses, and they know it. But in the midst of this, Hugh Glass appears different. His son is half-Native American. He endures constant flashbacks (some of them a bit disconcerting) of his Native American wife and of the terrible things that happened to her tribe. His son, Hawk, is as noble as he is, and therein lies a problem. Fifteen minutes in, you know things are gonna go very wrong for Glass. And you know why. And how. It’s not just about racism. It’s about how some people know what honor is, and everyone else does not. Kinda sounds like modern-day reality, right? I suppose some people might say that the majority of the movie is a revenge/redemption trip similar to Braveheart. Or maybe a survival tale a la The Grey. I get it. And there are definitely moments in the movie that will confuse some folks. There’s not a ton of dialog. There are no one-liners. All the movie’s glory is given over to nature, not to man. Once it comes down to one dude slogging his way through the brutal wilderness, there is a slowness that will drive some movie-goers away. That’s all well and good. But if you love movies, and you have a soul, and you’re willing to stop worrying about just simply being entertained, you’ll find something in The Revenant. It’s not just about white people fighting natives. The bad guys don’t wear capes to make themselves easy to hate. Every deed that happens here feels like it really could go down. It’s all so bloody human. When you finish watching it, sit down and ask yourself if you’d never do the things the bad guys do in this movie. If you’re honest with yourself, really honest, you’ll be conflicted. And that’s beautiful. Because the best movies should make you think. Look…I’m not sure whether or not The Revenant is my favorite flick over the last year. It had a few strange moments, to be sure. And sometimes it walked a tightrope of not knowing whether to be hard and cold or a little abstract in meaning. But ultimately, if you like movies about realistic human conflict, this is up there with the best of them. I recommend you go see it early in the day. Preferably on a cold, rainy day. And then, after it’s over, maybe even several hours later, I think you’ll start to like it more and more. Like this review? Hit up my reviews of Mad Max – Fury Road, Whiplash, and my personal favorite, Ex Machina. Or, since we’re talking about seriously dark fiction, drown in my short story, Let the Bodies. Tagged Bear Mauling, Best Movie of 2015, Oscar For Leo, Return from the Dead, Survival of the Fittest.